The title gives the impression that this short book will concentrate on the destroyer USS Kidd (DD-661), now a museum ship in Baton Rouge, Louisiana. In spite of this, about half of the pages present general naval history and destroyer development in the interwar period (1919-1939) and technical details related to the general arrangement and armament of the 175 Fletcher-class destroyers commissioned by the US Navy during WWII. Although the technical sections have brief references to the destroyer Kidd, which is a Fletcher-class destroyer commissioned in April 1943, the descriptions delve into engineering details of the Fletcher-class destroyer compartments and armament that are far beyond that found in most ship histories. The book's technical focus most likely reflects the expertise of the author Robert F. Sumrall, who has extensive background in naval architecture and marine engineering and has written or co-written several books on individual ships or ship classes in the US Navy such as Sumner-Gearing Class Destroyers (1995) and Iowa Class Battleships (1989). As might be expected in a book filled with technical details, it lacks personal stories and experiences of Kidd's crew. The Introduction covers the career of Rear Admiral Isaac Campbell Kidd for whom the destroyer is named. He died as the senior officer present on the battleship USS Arizona when the Japanese attack on Pearl Harbor sunk the ship. A nine-page section in the book's last half gives Kidd's operational history with the focus on action in WWII. 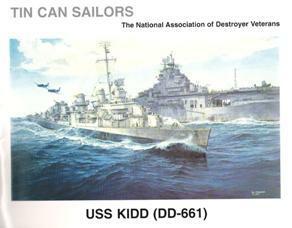 The most interesting section tells about the restoration of USS Kidd after being decommissioned and mothballed in 1964. The destroyer opened to the public in 1983 as a museum ship moored in the Mississippi River along the shore of Baton Rouge. Over the years the destroyer has been restored as closely as possible to her August 1945 configuration. Many pieces of equipment and artifacts have been donated to the museum ship from various sources in order to make possible the restoration to the wartime configuration. The many photographs that fill this book probably will be of most interest to readers. They include numerous ones of USS Kidd as outfitted in different configurations over time. There are also several line drawings and artist renderings of the destroyer as outfitted with different equipment and armament. The book also has photographs of other Sumner-class destroyers, various equipment and armament (most not on Kidd), and compartments as they appear today on Kidd as a museum ship. Three pages describe and show several photos of the kamikaze aircraft attack on USS Kidd on April 11, 1945, and its aftermath. The attack by a bomb-laden Zero fighter killed 38 men and wounded 55 others. The kamikaze pilot first targeted the destroyer Black (DD-666) but passed over her after pulling up abruptly and continued on skimming the water toward the destroyer Kidd. 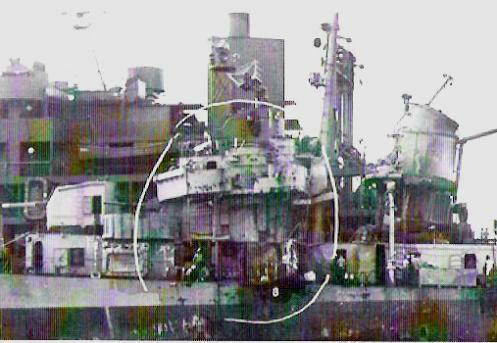 The Zero crossed the forward fire room from starboard to port about a foot below the main deck, and the bomb exploded just outside the port side of the hull. The book has a photograph of Lieutenant Shigehisa Yaguchi, the kamikaze pilot who attacked Kidd, but the author does not explain how it was determined that he was the pilot. This rather dry history has a few entertaining bits of information. It explains how Scottish pirate William Kidd (the notorious Captain Kidd) became the ship's mascot. The pirate skull and crossbones flag flew when Kidd moved to the Brooklyn Navy Yard for fitting out and commissioning. Later the crew had a 13-foot-high image of the infamous pirate painted on the Number 1 stack. Kidd's nickname became "Pirate of the Pacific" during WWII. causing numerous casualties and extensive damage in bridge area.